Pulled into New Orleans, staying at St Bernard State Park, just outside Poydras and Chalmette, two poorer suburbs of New Orleans. Vote or Die signs up, lots of people milling around on the street, and 10 pieces of chicken for $3. The campground host was delighted to have us, and pressed all sorts of freebies on us, from little boxes of cereal to pens, stickers, and coffee cups. Way more than we could possibly use. But she was very nice, and she had a place for us to stay which was lovely. Set up the tent in the hot muggy tropical green landscape that is Southern Louisiana, and went into town. We were looking for lunch, but we found giant mixed drinks on bourbon street first. The french quarter is really pretty, and a wonderful architectural feast. (So is the rest of New Orleans for that matter) Bourbon Street is rather kitschy, playing to the travelling fratboy sporto who wants to drink bud. So be it. We got cigars, drank miller lite, and walked around being tourists. It was fun. I got my haircut by a friendly bunch of hairstylists who'd just set up shop together, and were gossipping, drinking and chatting while snipping. Very trendy, and not nearly as expensive as I was fearing. Beignets at Cafe du Monde, which are wonderfully delicious, more wondering before dinner at Mothers, which was also tasty. Ended up at Ryans (I think) being beer snobs, and chatting to a bunch of people who were in a weight loss club, and were going off on a cruise together. Even met a guy who worked at disney, and was going to get us in to a big food and wine fair at Epcot, on top of just disney world itself. Didn't happen of course. Pretty good night all told. Eventually we went home, and tried to sleep in. We didn't get to, because a) it was hot and muggy, and b) it was wet. We'd left the fly off, and the windows open to let some air through, and it had rained on us during the night. We were therefore a little grumpy and tired for most of the next day. We went for a driving tour of the rest of the city, and saw some wonderful houses, and then with time on our hands, we started fishing for ideas, and finally settled on going out and visiting one or more of the plantation houses. 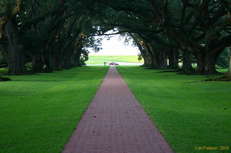 We went to Oak Alley, partly because it was going to still be open. Nice place, nice grounds, not very knowledgeable tour guides, (they only knew the script, and despite inviting questions, didn't really let you ask questions during the spiel) and a bit overpriced. And the shop was closed! 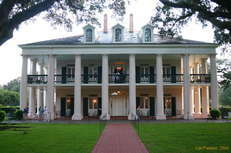 So we couldn't even sip mint juleps on the porch, and pretend to be rich socialites. That night was Halloween proper, so we were all set for a big night again. Had a DELICIOUS meal at a place called Oceana, just south of bourbon st, and somewhere in the middle. Katie didn't like seafood, but I couldn't leave without having at least one meal! And this place even had good beer! How novel. Walked up and down bourbon street a bit, but got fairly tired of it. We'd heard that we should try and get to Frenchmans St, which was meant to be less touristy, cooler and more local, so we headed off in that general direction, exploring the housing and side streets as we went. Met a lot more of the local character, but Katie was fading fast unfortunately, so rather than try and carry her around for the night, we headed home again.